The 4X2 HIFI HDMI matrix access to four HDMI sink with stereo audio output, using four HDMI sources. 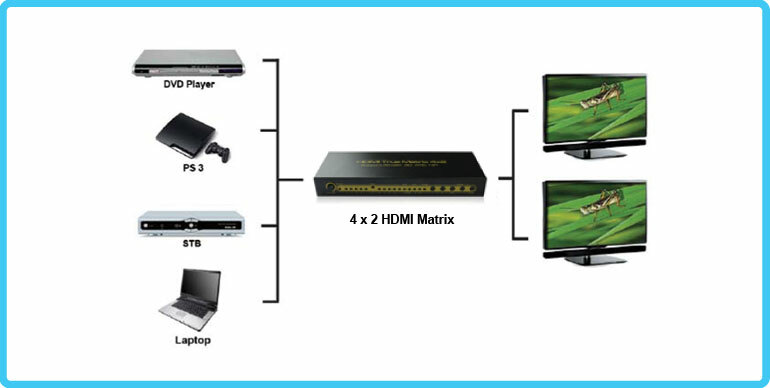 The matrix allows four HDMI devices to be switched or split easily to two HDMI compatible monitors or projectors. One of the HDMI outputs is with audio output by SPDIF or by 3.5mm Stereo Audio output. 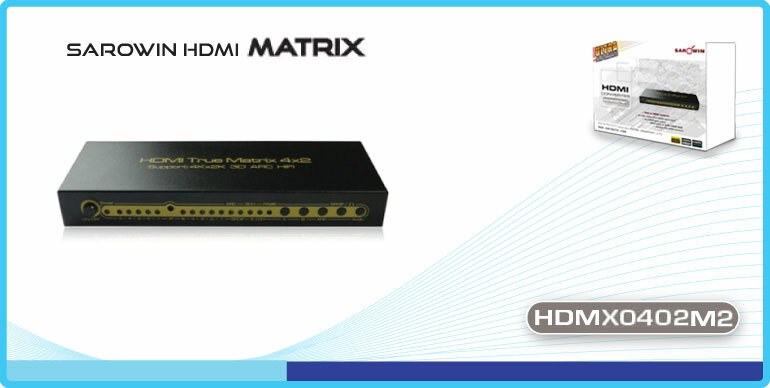 The Matrix can also be place at the end of long HDMI cable to regenerate the HDMI signal. Our devices offers solutions for noise, space and security concerns, data center control, information distribution, conference room presentation, school and corporate training environments. 1. Connect one cable from each HDMI source devices into HDMI Matrix inputs. 3. Connect audio output SPIDIF or COAX with stereo equipement. 2) Connect one piece of CAT-5e/6 cable to both of the output of the Sender and input of the Receiver. 2. The A and B signifies the HDMI A output and B output. 4. The plastic film is strongly advised to insert the rear of the remote board when the remote is not used for long time. Please use the machine as the instruction listed to keep the long use lifetime of the machine. 1. The machine should be placed at the spot far from the Damp, High-temperature, Dusty,, Erosive, and oxidation environment. 7. Please use the original factory power adapter.